It’s here! Easter is this weekend. How are your menus looking? 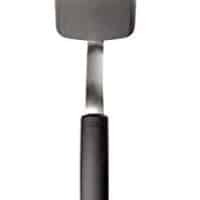 Do you have an Easter brunch or do you have a big dinner? 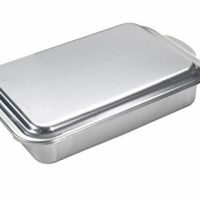 You know how I love my breakfast food, so I thought I would help those of you who are struggling to round out your brunch menu. Here’s a super easy last minute Easter brunch idea. 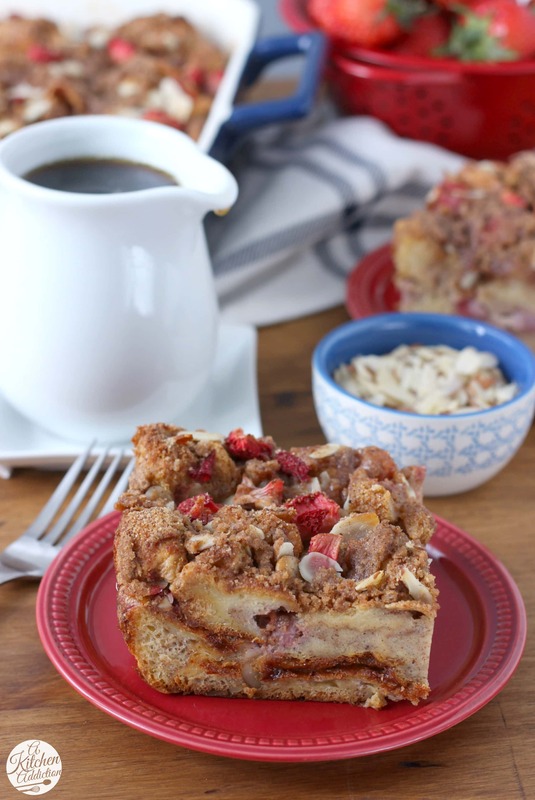 Strawberry honey almond french toast bake! 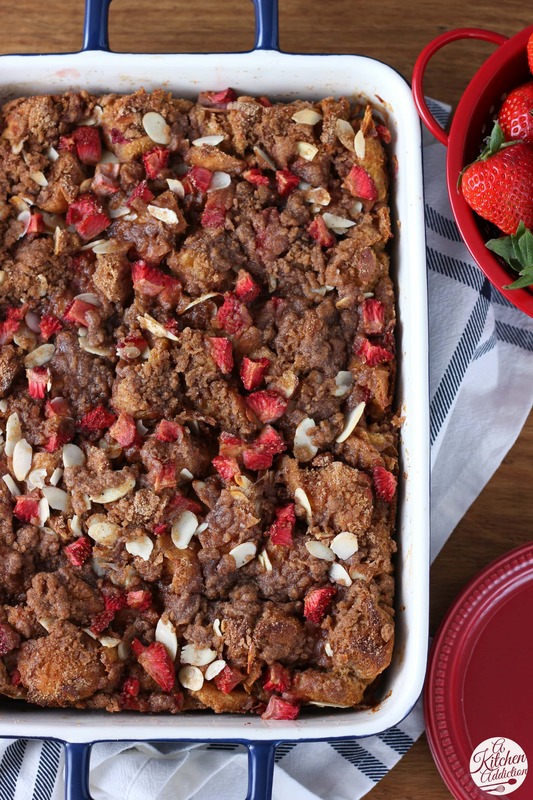 Fresh, juicy strawberries combine with cinnamon and nutmeg to make this french toast bake burst with spring flavor. I like the light flavor of honey combined with strawberries, so I knew I needed to add that combination to this french toast. So, along with some sweetness from pure maple syrup, honey is added to sweeten it. And to top it off? 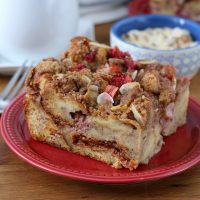 A sprinkling of streusel and sliced almonds tops the french toast bake giving you a sweet crunch in each bite. I love how easy french toast bakes are and how you can make most of them the night before. This one is no different. Just mix it all together the night before, and pop it in the oven the next day. 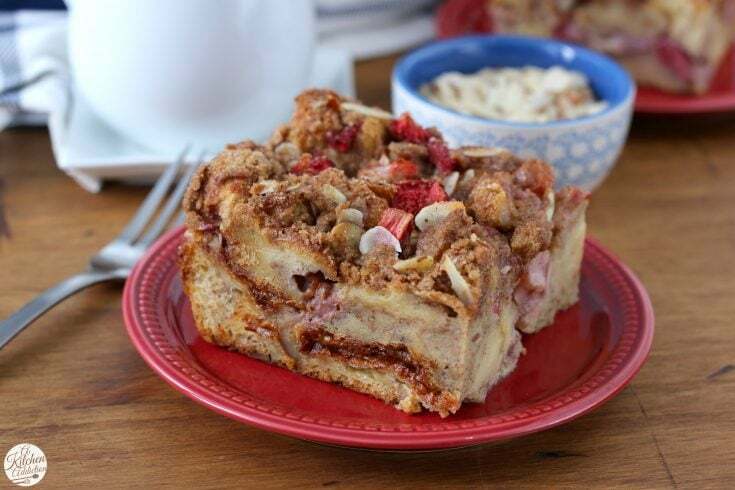 Whether you’re in need of a last minute Easter brunch idea or just want something a little extra special for breakfast, this french toast bake is sure to be a crowd pleaser! In a separate large bowl, whisk together eggs, honey, maple syrup, milk, vanilla extract, cinnamon, and nutmeg. 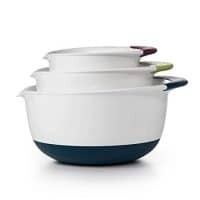 Pour over cubed bread and stir to combine. Gently stir in 1 1/2 cup sliced strawberries and 1/4 cup sliced almonds. In a small bowl, whisk together brown sugar, flour, cinnamon, nutmeg, and salt. Cut in butter until mixture resembles coarse crumbs. Sprinkle over the top. Sprinkle strawberries and sliced almonds over the top. This is such a gorgeous french toast bake! I love the strawberry and honey combination. Sounds so perfect for Easter! This looks and sounds heavenly! Perfect for Easter morning or any morning for that matter! This looks like exactly what I want to be eating for breakfast right now. Yum!! I love the cinnamony french toast stuffed full of the sweet strawberries! We always do dinner on the holidays but I always WISH we would do brunch! Lol. I loooooove brunch! 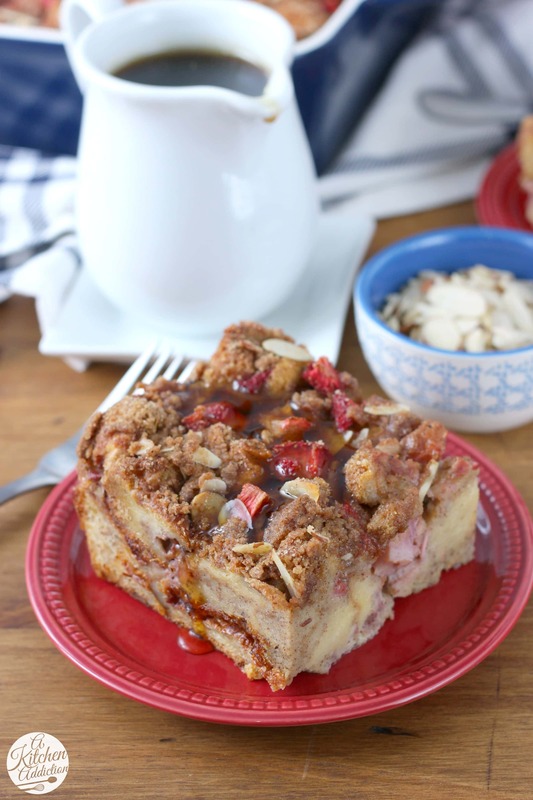 This French Toast bake is something that I know would be a big hit in my family! What a great combination of flavors! This looks delightful. I’ve never tried a strawberry french toast and I think I need to change that stat by the looks of this delicious breakfast! What a great spring time brunch recipe! I particularly like the streusel topping!